The Limited Edition Gran Turismo Entertainment Pack, announced for Japan last month, is coming to the U.S. on Oct. 20 and brings with it an interesting freebie. The $200 pack will include a "mystic silver" PSP-3000 (that's not the PSPGo), a copy of Gran Turismo PSP, an exclusive car download, a Playstation Network movie voucher, a 2GB Memory Stick PRO Duo and a music voucher. I believe this may be the first time Sony is including a music voucher with a PSP bundle. The music voucher is good for 10 free songs from Sony Music Pass. The odd thing is that they need to be downloaded to your PC or Mac, and apparently can't be directly downloaded to your PSP. I sure hope that this is a sign that feature is coming though. Gran Turismo for the PSP features more than 800 vehicle models from the world's top manufacturers with more than 4,500 total paint variations, and 35 tracks . The game, which runs at 60 frames per second, also allows gamers to trade and share unlocked vehicles with others online via ad hoc mode. Car download - Includes an exclusive PlayStation Network voucher to download a white version of the Chevrolet Corvette ZR1 for Gran Turismo, the same car featured on the cover of the game. PlayStation Network movie voucher - Consumers can easily download a movie from the PlayStation Network to their PSP system. Title to be announced. 2GB Memory Stick PRO Duo - Leverages the PSP system's multimedia functionality by storing photos, music, videos, and game saves. 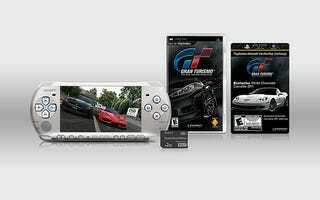 In Japan, the bundle includes a copy of Gran Turismo PSP and a PSP-3000, which is black with a Gran Turismo logo on the front. Pricing for the bundle, which is due out there on October 1, has not yet been announced.